McNeill Palm offers a wide range of shades to create your beautiful home one window at a time. We provide multiple kinds of shades to choose from including some of the best product lines offered by Hunter Douglas and other brands. The original cellular shades, Cellular Honeycomb Shades are specifically engineered to provide beauty and energy efficiency at the window in both cold and warm climates. Their honeycomb construction traps air in distinct pockets, which creates insulation that can help lower your energy consumption and energy bills. Our three types of custom-made Roman shades from Hunter Douglas combine the look of soft fabric folds with the ease and convenience of a shade. Our Hunter Douglas collection of roller shades and solar roller shades offer excellent light control while providing a clean, modern look in a wide range of fabrics and materials. Combining the simplicity of a roller shade with an intriguing curved design, Sonnette™ Cellular Roller Shades feature energy-efficient construction along with two fabric layers that create a beautiful glow. The Designer Roller Shades combine the ease and simplicity of a roller shade with hundreds of fabric choices—sheers to opaques, patterns to textures, and traditional solid colors. For excellent UV protection while maintaining your view of the outdoors, the Designer Screen Shades are available in varying levels of openness. Offering a minimal yet sophisticated look with light control, color and style, they are the perfect shade for any room in the home even your patio or sunroom. 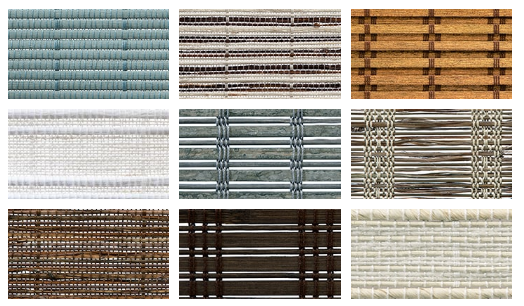 Hand-woven from natural fibers, Provenance® Woven Wood Shades add natural beauty creating a design story of light, texture, and color for every window in your home. Crafted from natural woods, reeds, bamboo and grasses, Provenance® Woven Wood Shades lend beauty and light to transform your décor. From textured fabrics to lighter more refined weaves, natural fibers add an organic style to your room filtering sunlight beautifully.